At a neighborhood dinner I sat by a woman whose daughter had just gotten married. Since my oldest was planning her wedding, the conversation naturally turned to expenses. I told her we were investing in buying decorations since we’d have more weddings in the future, and were trying to keep down costs by doing everything ourselves. I was stunned silent. Was she insinuating that I didn’t treasure my four daughters? That I had too many kids to show proper attention to? That I was cheap? Fortunately for both of us, more people joined our table, and the conversation mercifully shifted. I didn’t know how to respond to her insults. Recently a friend asked how another of my daughters was doing, and I told her she was thrilled to have found a major in college that she truly loved. I said that she’d been struggling to “find” herself, and another woman who was listening in said, rather dismissively, “All of us struggle to find ourselves.” Her attitude of So your daughter isn’t anything special or important, hung thickly in the air. Again, my inability to respond when I’m surprised kicked in, and I was silent. Fortunately. As I’ve reflected on those exchanges–and many others when I perceived I or my family was being slighted–I’ve thought about what I should have said. And always it’s the same. When someone offends you, say nothing. Because over the years I’ve discovered that when someone goes on the offensive, it’s because they’re feeling defensive. As I’ve written before, no one who is happy or content in their lives purposely go about offending people. And most of the time, offenses aren’t intended; they’re accidental. But when a slight is intended, I’ve discovered that it’s caused by pain. Something about a situation triggers pain (or fear, or anxiety) and the reaction is to defend one’s self with a deliberate offense. A pre-emptive strike, if you will. While I heard the snideness in the remarks, I also heard the pain lurking underneath. For example, the woman who suggested I didn’t spoil my daughter enough always wanted six children, mostly girls. That had been her dream since she was a little. She got one daughter, and two sons, after a lot of costly medical intervention. The fact that I had four daughters, and that I inadvertently reminded her that I effortlessly achieved the dream she never could awakened her pain. Same with the woman who flippantly dismissed my daughter’s found happiness, because her own daughter had tried to “find” herself, and found drugs instead, then found herself in jail. While my daughter found herself admitted to a competitive college program. I agree, it’s not. Not that I live an enchanted life by any means. I could have countered with claims about our family’s anxiety and depression issues, or our financial stresses, or any number of other trials to prove that yes, I feel pain too! But trying to trump someone else’s pain with detailed claims of your own never works. You can’t conquer pain with more pain. There are no winners in the “my experience is worse than yours!” battle. Over the years I’ve tried to listen for the pain, or fear, or quiet whimper of, “It’s so unfair!” when I hear a remark that could be considered offensive. It’s always there, in the background. 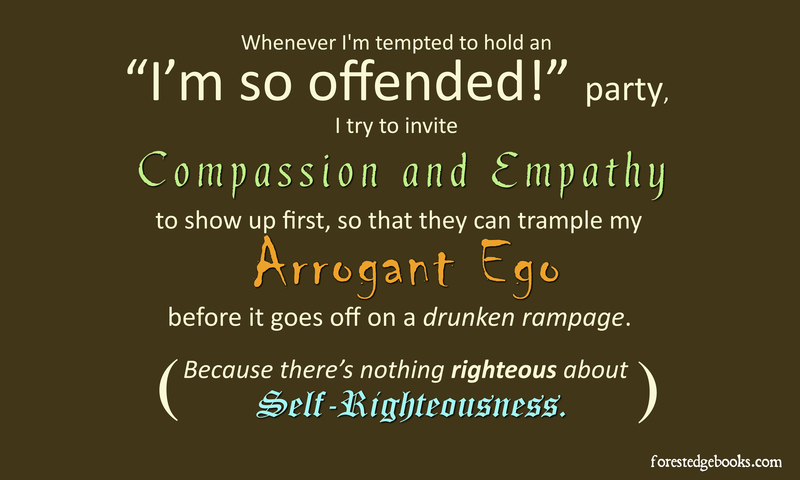 Whenever I’m tempted to hold a “I’m so offended!” party, I try to invite Compassion and Empathy to show up first, so that they can trample my Arrogant Ego before it goes off on a drunken rampage. Because despite the term, there’s nothing “righteous” about Self-Righteousness. This past week I’ve analyzed “offenses” in the news and social media, and looked for the pain or fear beneath it. From the silly (think Starbucks) to the severe (think terrorism strikes, everywhere), folks are “offended” that we’re not doing things right: not worshipping enough, or worshipping too much; not empathizing enough, or empathizing with too few sufferers; not caring about others, or caring too much . . .
Everyone chooses to be offended. There’s nothing we can do about that, except choose not to take offense ourselves, and listen instead for the pain hiding underneath.